So the Grammys have come and gone and in their wake a Queen’s reign was solidified. Yep people it’s now official Her Royal Bootilisciousness is now the biggest female artist on the planet after setting a record of most Grammy wins by a female in one year. The former Destiny's Child singer snagged Grammys for best R&B song for “Single Ladies” and best contemporary R&B album for her chart-topping “I Am ... Sasha Fierce” as well as best traditional R&B vocal performance for “At Last." Queen Bey also won the prestigious Song of the Year award for her hit “Single Ladies (Put a Ring On It)", which also earned her the best female RnB vocal award. Now I have always had reservations about Beyonce. I think she isn’t original. In most of her shows and songs she rips off other people’s work and very seldom gives credit to them. I wrote an article about her concepts’ being unoriginal. I also think Beyonce isn’t the greatest of all singers however whether you are Beyonce fan or not, it would be preposterous to say she has no talent and ignorant to not acknowledge her impact in the world music scene . Sometimes one needs to judge an artist on based artistic merit and not personal taste. Judging by Bey’s success she is the best in the game. I mean to achieve the heights she has in such a short period of time is astounding and deserves an applause. 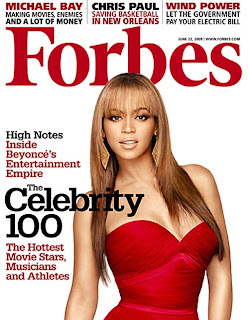 Queen Beyonce Giselle Knowles-Carter was ranked no 4 on Forbes’ 2009 Celebrity 100 with earnings of $87mil last year. At 29 she has won 16 Grammys (among other awards) and has sold over 120mil albumns i.e abt 70mil with Destiny’s Child and abt 55mil on her own. Should Bey’s star power keep rising like this she is set to beat the Grammy record of 26 Grammys won by a female artist set by Allison Krauss. At this stage she only needs 3 to beat Aretha Franklin’s record of 18 Grammys by a black female artist. Mrs Shawn Corey Carter-Knowles’s achievements are just too numerous to mention so I’ll just leave it at that and just say Big Up Gurl !!! Beyonce is my girl. For all her critics who think she is overrated will have something else to talk about. She is the biggest artiste we have ever seen in a long time. I wish her all the best - I love her music. she will be in a neighbouring island soon but I cant make it.